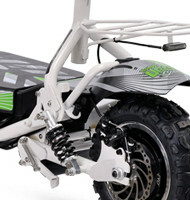 The 1000W 48V has a Max Speed of 40km/h, and uses a 48V 12AH SLA (110V – 240V) Battery Charger. 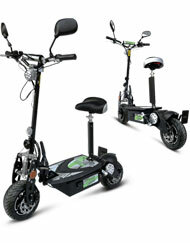 The Charge Range for the 1000W is 20km, which is about 45 minutes, and the Charge Time equals 6-8 hours. 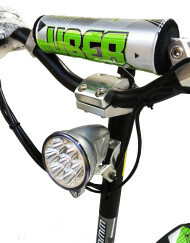 The 1000W has approximately 400 Charge Cycles, a Chain Final Transmission and uses a Key Switch Starting System. 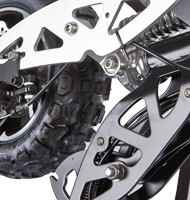 A Cam Link Suspension is found on the front, and a Dual Shock Suspension on the rear, with Motocross style Handlebar Setup and optional LED lighting for the front and rear including brake light (included). 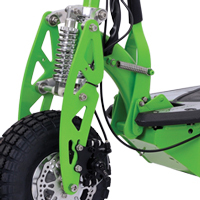 Dimensions are 1250L x 250W x 1100Hmm without mirrors, Seat Height is 760mm max, Wheelbase is 980mm and Minimum Ground Clearance is 150mm. 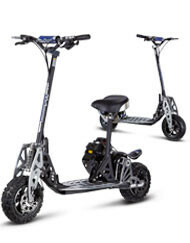 Recommended Max Rider Weight is 120kg, and Recommended Age is 12 years and over. 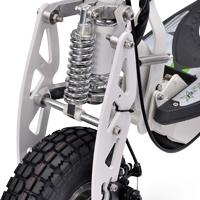 The 1000W is suitable for all levels, recreation use and is EU (EEC) Road Legal in certain regions. SKU: ES17. 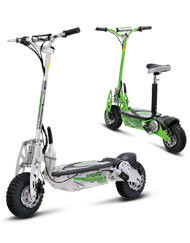 Category: 48 V scooter. 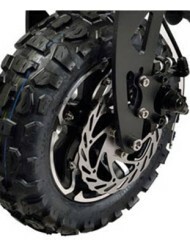 Tags: off road tyres, seat included. 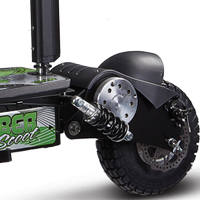 The 1000W 48V Uber Scoot is the perfect solution for long-distance commuting, fitted with the furthest single charge range of any electric scooter currently on the market. 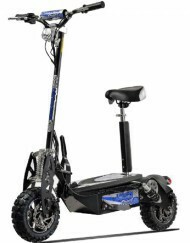 The 48V model weighs at just 38kg, and features a compact and easy to use lock-down/up folding system for simple storage and transportation. 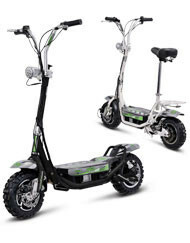 Other features found on the 1000W include an ergonomically designed and easy to remove seat, plus 90/60-6.5 street tyres and durable suspension for hours of safe and comfortable riding. 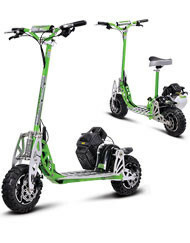 The 1000W is fitted with SLA gel 48V batteries with an 18km range, which can be replaced with 48V lithium batteries to increase travel range to over 40km in addition to reducing the overall weight of the scooter. 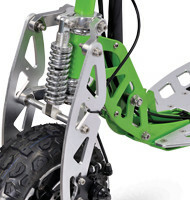 Also included are 140mm front and rear disc brakes, a water resistant digital electronics controller, and a road-legal lighting and mirror kit.